Thought for the week: GE was like a box of chocolates – you never knew what you were going to get! Can it change? Whether Mr. Flannery is successful as the new CEO of GE or whether he has a shorter term than Mike Parker did at Dow Chemical will depend very much on his personal ambition, self and company awareness, as well as how much money he wants to make. Trian and other holders are going to insist on a compensation scheme for Mr. Flannery with shareholder return as a major component and real upside only if he gets it very right. Simplify the company, but do so in a way that derives maximum value to GE holders. Sell the stake in the energy business after the value of the synergies have accrued to the GE shareholders. Spin, split or sell the Healthcare business – but only sell if it can be tax efficient. Drive all stranded costs out of the company and consider splitting the transport and power pieces. Unlike DuPont, there is no Dow “White Knight” to propose a creative merger. 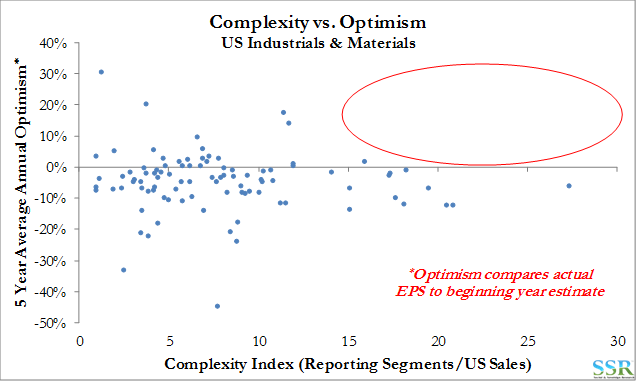 Bottom line, as we mentioned in our research this morning – there are no complex companies that do not have optimistic managers – leading to earnings misses and the misallocation of capital – chart. GE must simplify if it is going to succeed. This is unlikely the full story and the full story is much more interesting in our view. Ineos is not a company to waste capital or to put capital at too significant a risk. The company is a fantastic “bottom fisher” buying assets that others do not want at the trough of cycles. This is something different, and we would be stunned if the company would commit a further $2bn on the basis that importing ethane and propane from the US is going to be attractive for the life of a long-lived asset like a new PDH unit. It is far more likely that Ineos is planning ahead based on its assessment of the UK shale opportunity. The company has been buying natural gas assets in the UK and the North Sea for the last couple of years and has a shale drilling initiative in the UK which is just getting underway. It is believed that the UK has one of the richest shale beds – oil and gas – in Europe and Ineos is the pioneer. If successful this is good for Ineos, but may not help anyone else in Europe. The investment to convert a naphtha cracker to ethane is not insignificant, but if others do make even some investment, propylene will become quite short in Europe – hence Ineos’ move to build PDH. 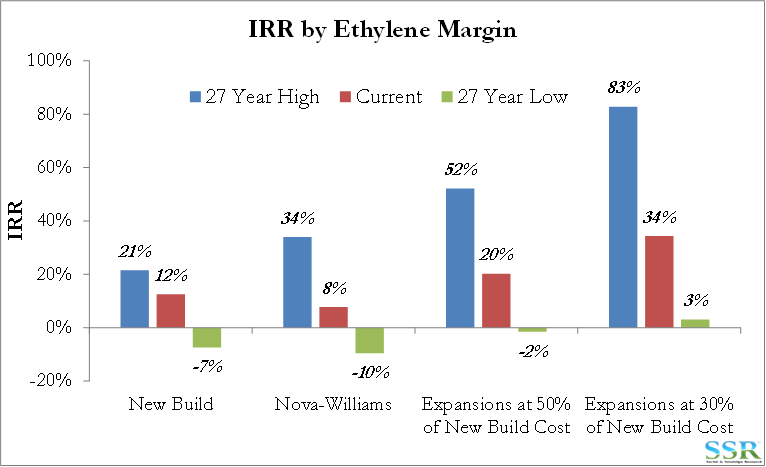 We like the ethylene expansions – low cost incremental capacity. We don’t like anyone paying full price for anything in this business – see research linked above – and would encourage Ineos to look for a cheaper way to build the PDH units, possibly by using some used equipment as the original Petrologistics plant (now Koch) in the US did. While the chart below is a US chart – it is illustrative. Ineos is suggesting around 45% of replacement cost for its ethylene expansions. It is a shame that Ineos is not a public company! 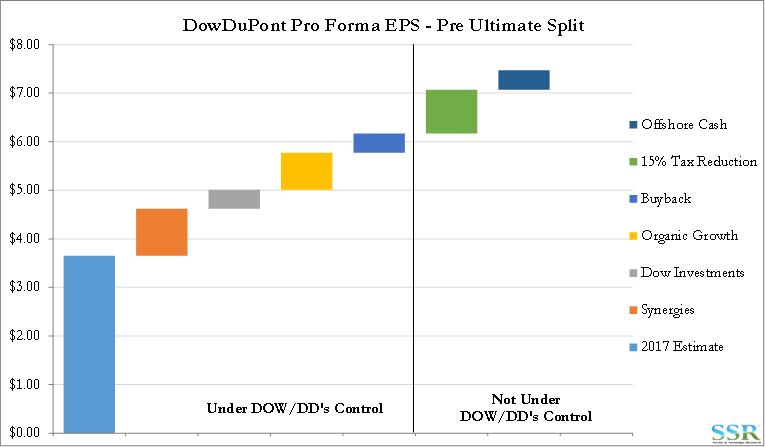 With US regulatory approval in the rear-view mirror, the odds of the Dow/DuPont merger happening within 75 days are close to 100%. So, now it is time to focus on what is next. As we have written in past research, we believe that the new company will over-deliver on synergies both on the amount and on the proposed timing. With over 18 months to prepare they should be ready to throw the switch on the combined SAP management system almost immediately and this is where a chunk of the costs will come from and older systems become redundant. On the Ag side, it is likely that the businesses already know who will keep which jobs and how they will operate from a sales and distribution perspective on Day 1. There will be a lot of lay-offs and most of the cost savings will come from a reduction in the workforce – more focused in Delaware and Indianapolis than in Midland, with Dow’s new R&D initiative in Midland maybe offsetting some Midland job losses. We would expect clarity over leadership of each of the businesses shortly. There might be some tinkering around the edges of what constitutes materials and specialties – paying some attention to what Third Point is suggesting but we will likely not see this before the deal closes and we do not expect much. It is possible that we will see some quick divestments – where the companies have already been approached and for assets and businesses that might have a much higher value to someone else. Top of our list would be the combined electronics platform and DuPont Nutrition.